No X for the rest of the world? US carrier AT&T announced at CES 2014 that it will be ranging the new Asus PadFone X exclusively in the US. 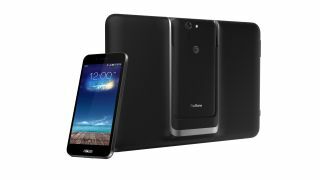 Though Asus itself hasn't unveiled the PadFone X yet, AT&T confirmed that it will follow a similar smartphone-and-tablet-in-one design of the PadFone Infinity released globally last year with a 5-inch smartphone and 9-inch tablet. No prices or availability has been announced, but it will sport LTE-Advanced technology, with Android KitKat 4.4 running the show. It will also support Voice over LTE (VoLTE) and HD Voice. While AT&T will be offering the PadFone X in the US, nothing has been said about a global release, nor does it sound like there will be. An AT&T spokesperson confirmed that the PadFone X will be offered exclusively Stateside, as the PadFone Infinity – which was released globally last year – was not released in the US. The spokesperson also said that the PadFone X will have a number of different features to the PadFone Infinity beyond the slightly smaller tablet size and updated OS. Want to know more about the PadFone hybrids? Try our PadFone Infinity review.